I recently threw a luau-themed party that I can't wait to share with you! In the meantime, I wanted to give you a peek at these cute little snack cups that I used for the dessert table. These were perfect for the kids to grab and they are super easy to make, so I wanted to share the tutorial with my lovely readers! 1. Use the hydrangea paper punch and heavy cardstock to punch out as many flowers as you'll need (you will need 2 flowers per cup). 2. Take 2 hydrangeas and bend each petal upward to create dimension. 3. Use the hot glue gun to glue one hydrangea on top of the other, placing the petals so they are not directly on top of each other. Be very careful not to burn your fingers!! 4. Use the hot glue gun to glue a small gem onto the center of your your flower. Once again, be very careful not to burn yourself! You need just the smallest dot of glue so that the glue doesn't overflow over the gem. 5. Glue the finished flower onto a plastic cup and you will have a simple, yet beautiful embellished snack cup. My little girl Skylar was even able to help me with this project - she loves to craft! 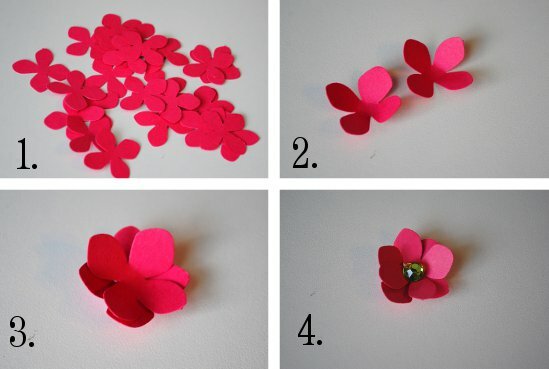 Have your little ones help you by punching out the individual flowers. Such darling flower embellishments for glasses! so cute! 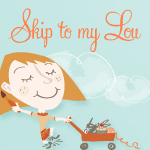 I'm your newest follower - I've just launched a summer-activity-ebook - feel free to join my blog and leave a link to this blog post at the bottom of the announcement - your craft would suit a summer-luau-party perfectly!